Dag Hjalmar Agne Carl Hammarskj�ld was a Swedish diplomat, economist and author and was the second Secretary-General of the United Nations. He served from April 1953 until his death in a plane crash in September 1961. He is the only person to have been awarded the Nobel Peace Prize posthumously. Hammarskj�ld remains the only U.N. Secretary-General to die in office. 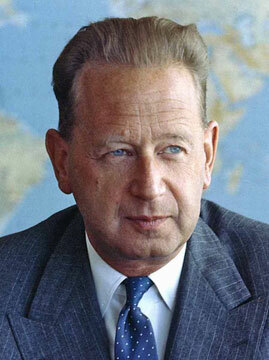 U.S. President John F. Kennedy called Hammarskj�ld "the greatest statesman of our century."